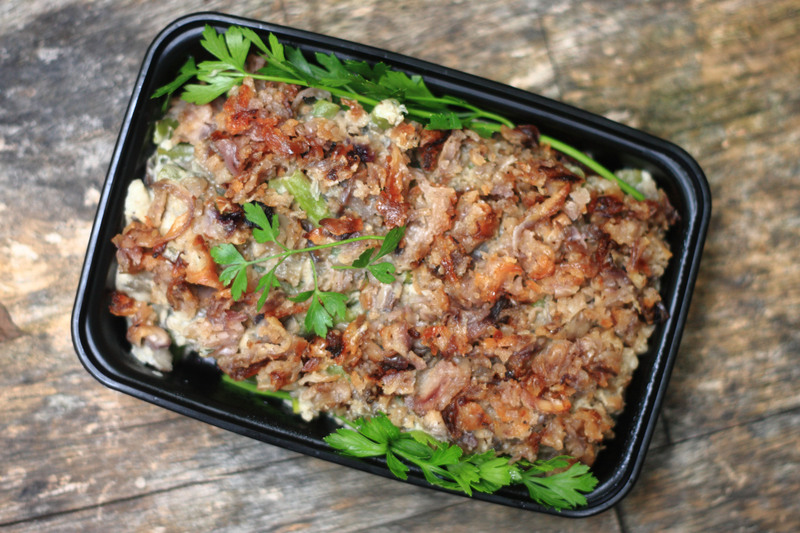 Home › Living Vegan › Vegan Thanksgiving Options In Charlotte, Part V … EXCLUSIVE SNEAK PEAK at Nourish’s Thanksgiving Menu! Oh, wow. Yesterday was a beautiful day. We went to the Renaissance Festival and although it was cold, we had bright Carolina blue skies and lots of sunshine (until about 4:00 PM, then it started to get rather miserable rather fast). Today was just kind of grim. Gray, cloudy. Skies that bespoke of snow, if only it were a wee bit colder. In other words, the kind of day you’d looove to have a hot dinner delivered to you. 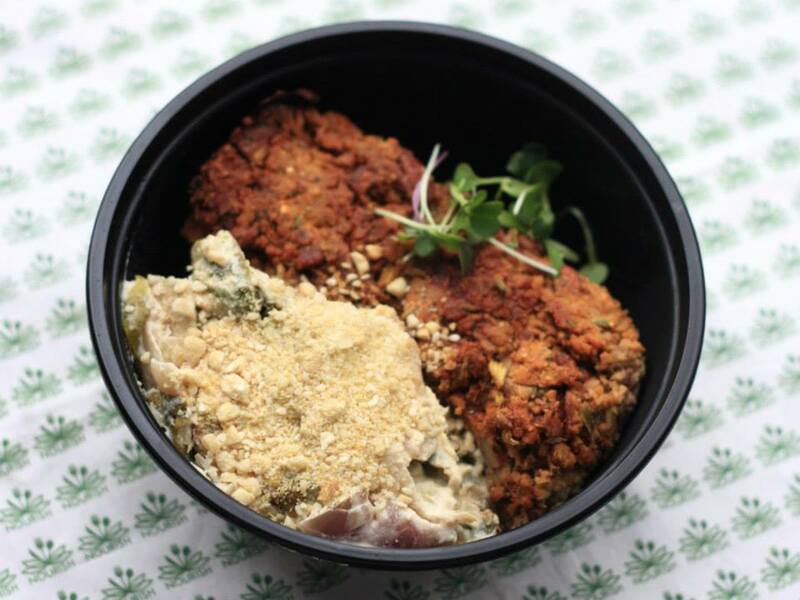 Which leads me to Nourish – Charlotte, NC’s weekly vegan meal delivery service. And not just vegan, but gluten-free. 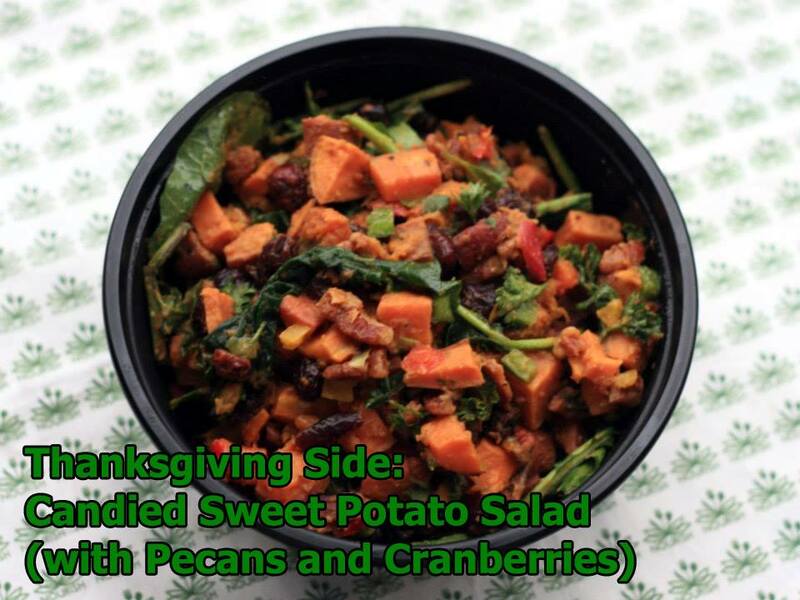 And locally sourced, whenever possible – their Thanksgiving menu features produce from Friendship Farms. Nourish has a Thanksgiving menu available for purchase MONDAY, NOVEMBER 17 at NOON … and I’m giving you an exclusive sneak peak now! Miso Glazed Tempeh Pecan Mushroom Loaf. This will actually come with Candied Sweet Potato Salad. 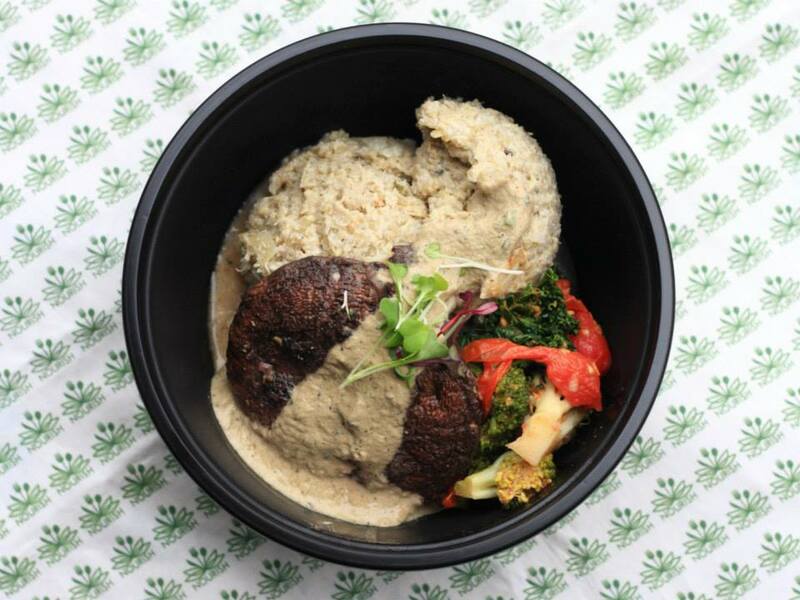 Cauliflower-Quinoa Mash with Miso-Mustard Gravy and Portobello Steaks. This will also come with Tomato-Braised Broccoli from Friendship Farms. 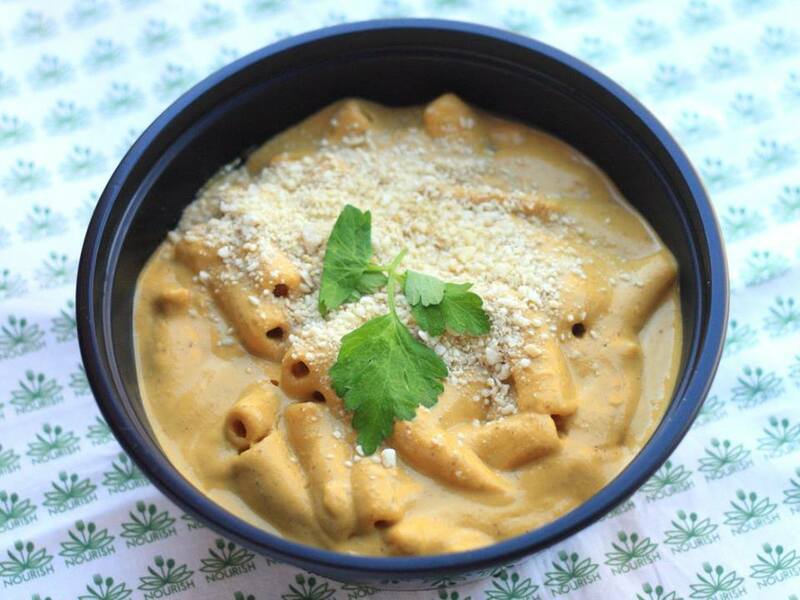 Butternut Squash Mac N “Cheeze.” This item practically has its own fan club. 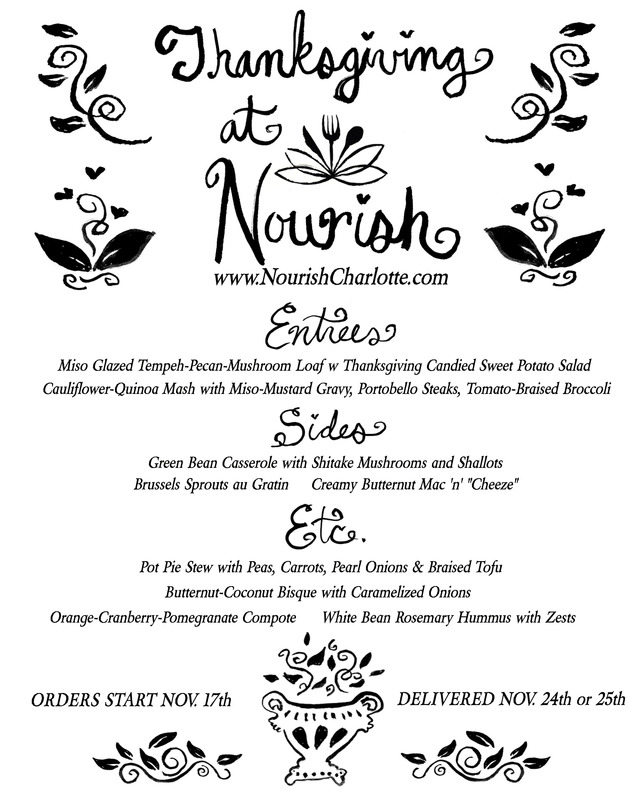 Menu goes live Monday, November 17th at NOON … https://nourishcharlotte.com/menu. Items will be delivered TO YOUR HOUSE OR WORKPLACE. Yay on gray days like this, when you don’t want to put on makeup (or shave as the case might be) or get out of your comfy sweatpants or flannel PJs. Delivery days are Monday the 24 or Tuesday the 25th. The menu is only up until Wednesday Thursday Noon – so place your order early! $40 minimum order. Even if you are a frugal vegan who can’t afford to order Nourish every week, you may still want to check out their weekly Monday menu during the holiday season. Many of their Mains and soups/”chowdahs” are freezer friendly and would be perfect to have, tucked away, for those busy holiday nights before a party or to heat up for guests.